82,000. That’s how many wells extract natural gas by using fracking. Fracking is part of a contentious debate across the U.S. But just how did we get to this modern day gold rush? How did we get to 82,000? 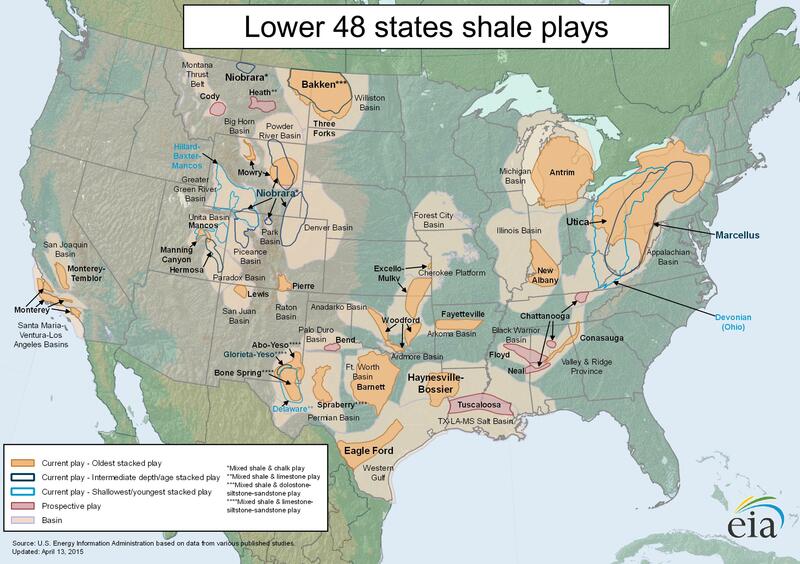 The fracking boom took off once scientists figured out how to tap shale rock. Shale gas now accounts for 40 percent of all natural gas in the U.S, bringing in big money, revitalizing rural areas across the country and creating over a million jobs and counting. 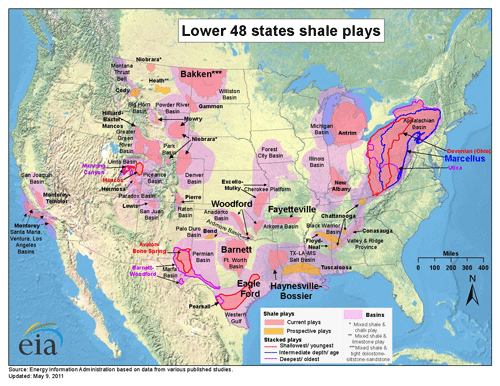 This map from the US Energy Information Administration shows possible fracking sites across the country. Click for a larger version. While fracking was present in some areas of the country before last decade, shale rock discoveries in places like Pennsylvania set off the natural gas craze. But it had consequences. In 2011, a Pennsylvania fracking site blew up, sending 30,000 gallons of contaminated fluid into rivers that lead into the Chesapeake Bay and give water to 6 million people. The State of Maryland is now sueing Chesapeake Energy. Fracking’s opportunities and dangers were brought on by decades of relaxed regulations for oil and gas companies, which were exempted from the Safe Drinking Water Act and Clean Air Act. Thus, here lies the conundrum: Fracking is getting people jobs and supplying us with energy. but activists call it Pandora’s box because there are question marks about just how safe it is for our water, land and air. But keep waiting for 2014. That’s when the Environmental Protection Agency will release the first comprehensive study on the impact of fracking, and we can find out whether the 82,000 wells are helping or hurting us. Do you think fracking is worth it? Would you be okay with it in your backyard? Sound off in the comments while we wait for the EPA’s report. Cory Weinberg is a senior majoring in Economics at The George Washington University. Chloe Sorvino is a senior majoring in Journalism and Mass Communication at The George Washington University.